for the first time in weeks i was unable to watch world cup when i woke up this morning. i had set my alarm and everything, but when i turned on the spanish channel (the announcers are so much more exciting than boring american announcers — besides, does anyone else think that dan (or dave, i forget) o’brien sounds like bob costas? and who says bob costas gets to cover every sporting event anyways? i think that this o’brien character is actually one of bob costas on-air personalities) there was a variety show on instead of football. i don’t dislike variety shows (and telemundo ones are the best of the best), but i was pretty sad to learn that there are no games until friday. in the short amount of time since the world cup started, i have become addicted to it. i didn’t realize how excited i was getting about it until this morning. and then i started wondering what my life will be like after it’s all over. no more world cup for 4 years. i can watch other football, but i don’t have cable, so that’s a little harder than i’d like it to be. as in, i would have to drive for 5 minutes to get to brian’s house. maybe i’ll take up parachuting. 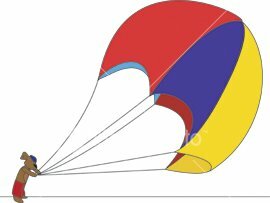 won’t taking up parachuting be harder than driving 5 minutes to get to brian’s house? I’ve been watching the game over on the spanish language channels because the announcers sound too much like Bob Costas.